Cat litter tracking is one of the most common complaints cat owners have. No matter where you keep your cat’s litter box, somehow litter ends up everywhere — on the floors, in your shoes, even in your bed! There’s nothing quite like having to brush litter bits off the bottoms of your feet before you put on your socks. Litter tracking is caused by bits of litter sticking to your cat’s paws and fur after she has used the litter box. Many cats also like to “dig to China” in their boxes, kicking and throwing litter all over the floor. Then they walk through the mess and bring it to every corner of your home. So, is there a cat litter that doesn’t track? How do you keep cat litter off the floor? Is there truly something like a no-mess litter box? Well, you can reduce the amount of litter tracking throughout your living space with these tips. 1. Is there a cat litter that doesn’t track? Reconsider the type of cat litter you’re using. 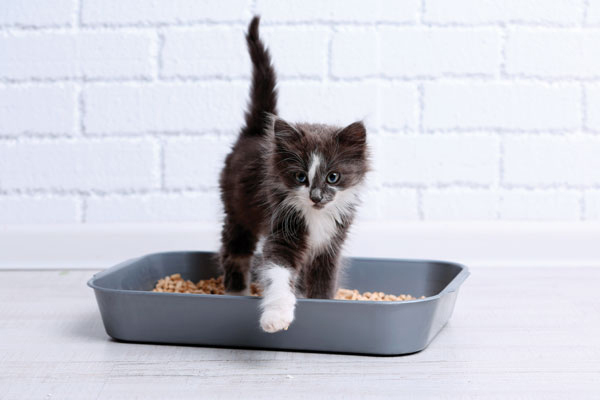 When it comes to cat litter tracking, think about the type of litter you’re using. Photography ©AH86 | Thinkstock. Is there a cat litter that doesn’t track? Well, some cat litters track more than others. In my (nonscientific) experience, I’ve found lightweight litters track more than heavier ones. Also, newspaper pellets don’t seem to track at all. But often we don’t have a whole lot of say in the litter our cat prefers, so let’s move on to things that might help no matter which litter you use. 2. How to keep cat litter off the floor? Use your broom and vacuum — a lot. It may go without saying, but keeping on top of the litter scatter in the immediate vicinity of the box helps control litter tracking. Sweep several times a day and you will have less of a problem. I have a broom and dustpan next to the litter boxes and a vacuum in the closet nearby. One woman told me her nonelectric roller vacuum does a great job as well. 3. Is there a no-mess litter box? Contain your cat’s litter box. If you have a spare bathroom, the tub or shower stall is a great place for the box. If your cat is older and arthritic, or a kitten, the tub may not be a great option, but for others it’s definitely worth a try. You might also consider investing in a plastic kiddie pool. Put the litter box inside the pool (no water of course, ha ha) and your cat can kick litter to his heart’s content and it will stay confined in the pool. Then, theoretically, by the time your cat hops out of the pool, much of that litter will have fallen off his paws on the way out. Another option to scale back on litter tracking is to take a large storage tub with high sides and cut an entry/exit hole in one side. Be sure to sand the edges of the hole so your sweetie doesn’t cut himself getting in and out. Put the litter box inside the storage tub so once the cat is finished with the box, he still has a few steps to make before he’s out on your floors. Trays underneath the litter box can also help. I’ve used a large plastic washing machine tray under the litter box, which helped keep the scatter from spreading. If you want to get fancy, consider “cat furniture” options like the Kattbank bench. It’s a decorative bench that houses a litter box and plastic grid that keeps litter inside; the cat has to cross the plastic grid to exit the bench, so the scatter is contained. 4. Is there a no-mess litter box? Rethink your cat’s litter box. 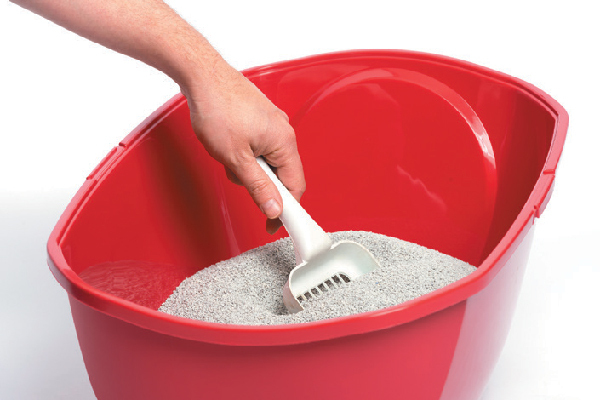 A high-sided litter box might help control cat litter tracking. Photography ©JoSchw10 | Thinkstock. High-sided litter boxes like NVR Miss help tremendously with the litter scatter issue (and with messy pee-ers, too). For a do-it-yourself option, you can use the deep, high-sided plastic storage box mentioned above and pour litter directly in it to use as your litter box. 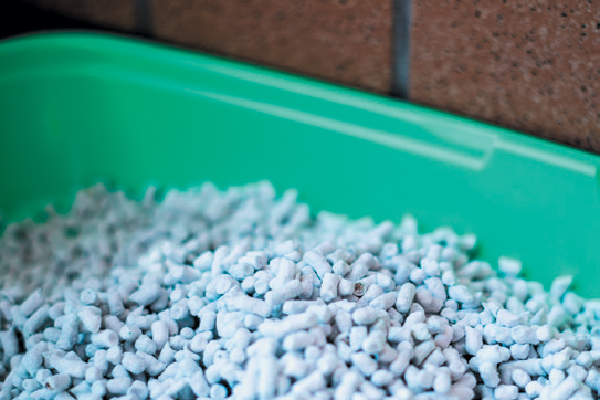 Top-entry litter boxes can help eliminate the scatter problem as well as the tracking issue. The cat can kick up litter and then hop out of the top, hopefully leaving most of that litter in the box. 5. How to keep cat litter off the floor? Employ rugs and mats to help stop litter tracking. There are plenty of rugs and mats available designed specifically to catch the litter stuck to your cat’s paws when he exits the litter box. You can choose from rubber mats with grooves to sisal rugs and everything in between. Even a regular throw rug or piece of carpet remnant works well to trap litter bits. Deep, shaggy bathmats are also effective. When choosing the size of mat or carpet, consider having your cat “walk the red carpet” after he uses the box. Lay a carpet runner from the litter box extending out about three feet, so the litter has plenty of time to dislodge from your cat’s paws. Any one of these suggestions will help reduce the amount of litter scatter and tracking in your home. But, like litter box scooping and early morning wake ups, a small amount of litter tracking is a way of life for a cat owner. But don’t you think it’s worth it? Tell us: What are your tips to control cat litter tracking? What sort of litter do you use? What type of litter box? I love the Litter Robot + the Arm&Hammer Lightweight litter. This is the best combo I have found. I keep a cheap vacuum behind my bedroom door. I just clean up in morning and night (if necessary). I have the rugs and tracking pads. Cats just track, everywhere and I have no place else to put little box. I do clean it more often, sometimes 3 times a day. The cleaning up is small to not having Ghost around. He is neat, but they track. I find litter everywhere. Not a lot but enough that it is annoying. I also have a litter box on front deck which has been made into a catio. When weather is nice he spends his days lusting to escape out on the deck. Vacuum was $20 and comes with a detachable handheld unit. Tracking is a fact of life. How small it becomes is an experiment in litters and catchers. I switched to the Tidy Cats Breeze litter box system a few months ago. No more smell or scatter. I have bamboo floors and have the boxes on the floor with no mats at all. And there is NO scatter. My one cat is an enthusiastic digger. Once in awhile I might find a pellet on the floor. I pick it up and toss it back in the litter box. I can walk everywhere barefoot! And the smell? One of my cats is an intact male. Walk in my house and you’d never know I had a cat at all. I am on another experiment at the moment. I have tried the litter mats along with other mats but still find litter in places I don’t want to find it. I read somewhere about someone using one of those plastic boot trays which I happened to have & was not using it for boots. It is now directly in front of the litter box so my boy has to walk across it, then a litter mat & then a normal mat. I will see if this makes any difference at all. I don’t have any carpeting in my apt. & I am constantly dusting & vacuuming but it’s the litter pebbles that end up on the couch or on the small table he sits on in front of the picture window, where I also set my coffee cup when I sit in my chair. I’ll try & let you know what happens. awesome suggestions! always looking for ways to keep the mess to a minimum! I’m running an experiment and hope it works. I’ve made a temporary raised platform for the litter box and a “porch” in front of it. the hope is that when they jump down, that most of the litter falls off. if so, I will then build a more permanent box with drawers to contain litter and cleaning supplies. the shelf is only 10 inches high. The rug or carpet remnant under in front of the box is a bad idea. Remember that some of that litter contains urine. That will sit in that carpet and create odors. Especially in warm temperatures. I like that you mentioned that it may be a good idea to get cat littler that doesn’t track easily. My wife and I are getting a cat, and we want to learn the best ways to keep everything clean. I will be sure to consider getting litter that won’t track, so I can keep the cat litter from scattering around the house. Hey just wanted to let you know , I have 7 cats, I also experimented to see what works. I found that the Arm & Hammer Slide litter works wonderful. It’s more sandy than rocky. I have an old 4×4 ft piece of carpet I put under 2 litter boxes, I also have 2 mats in front of these boxes. I just take it all outside and shake it off once a week. Maybe this helps, good luck. I finally bought a litter mat that I lay in front of the litter box. Edmond digs to China and there is always litter on the floor. I sweep my bathroom floor before every shower. In using the litter mat, I’ve accidentally left my shaggy bath mat in front of the box that sits perpendicular to the tub (one bedroom apt). The shaggy bath rug actually catches more litter, but I hate laundering it. I took in a semi-feral who was battered. She had no clue what litter was for so I took some regular soil/dirt from outside and put it in a cut down box (4″ depth). Took a piece of her fresh poo and a urine soaked sock to this dirt. Tossed them in.. the next time I looked both were “buried”, removed the sock and checked over the next 2 days. Sure enough she was using the box. I topped it up with more soil. Emptying after the week ..the box does get stinky but is a temporary “aid”. Graduated to litter soil blend, then litter and a highsided litterbox over aprox 6 weeks. No longer wild and the proper lady “potty habits” now .. good luck with your guy. Rusty was an outdoor cat and a deck buddy for years. Neutered, socialized, terrified by other cats but a really sweet boy. We finally took him in during an extremely cold winter much to the dismay of our then incumbent boy. He’s an only cat now with no conception of what a litter box is for. We’ve tried them upstairs and down but he prefers to pee in the corner of the alcove in front of the stairs. At least he uses the pee pads, soaking several a day. Pooping occurs down cellar on utility rugs. So no litter to clean up and we make allowances for him. I put a clean box where he pees. He peed on the door next to it. There is a box downstairs. He sniffed at it once. He used to pee on the bulkhead door until I put a pitcher of water in front of it. Sounds daft but they do it in Ireland outside a door where strays are known to pee and it deters them. Worked for me! I suspect that someone made this loving and socialized cat live outdoors because of his inappropriate bathrooms habits. Their loss, our gain. They probably think it’s a place to eat and drink and not pee…LOL! Some cats dont like to put thier feet in cat litter. I use the bottom half of an large carrier and ut folded newspapers in it. Absorbs urine odors pretty well.you might also try Swheat Scoop, or worlds best cat litter. Only about an 1 inch deep. Maybe give Cat Attract Litter or the Litter Attractant by Dr Elsey a try. They’ve worked well when I litter trained a few feral cats in the past. I’ve even had success with adding a pinch of catnip to get their attention. My cats also love the Touch of Outdoors. We had a feral cat and I mixed litter and dirt in his litter box. He did use it several times before he died from an unknown illness. Keeping the high-sided boxes together in a corner with a plastic container of litter on the other side (so the front is the only enterance- like a covered box without the build up of funk), plus a jute litter mat under both rugs (goes halfway under them and about 2 feet past), and a handheld vacuum nearby is the only combo I’ve had luck with- and they’re both ~20lb. cats who frequently feel the need to dig to China. Litter bounces off the walls and back into the box, or goes into the box next to it, and while somewhat difficult to spot clean, the jute mat does the rest! I use a nice mat from amazon that helps. Also a higher rimmed box. My cat has fur and it gets stuck to her paws so with the powder litter I see a lot less pain. With my last wonderful cat I needed a high backed box because he would back his tush up to the back and pee right out of the box. He was also fastidious and would dig and dig to cover his poop and pee. I found the the covered box with a front entry and air filter worked best. I also placed it on top of a long nap rug to help him clean his feet on exiting. The rug is oval shaped and the box is placed at one end leaving about 3 feet out front. So now with my new kitten ,I started with just the bottom. This enabled her to enter the box from any side. At 4 months I added the top. She was very easy with it. So now I have sand only in the rug right under the box, from where she exits. I also use box liners to make cleanup easy. Just pull up the bag and throw out the the dirty sand, put down a new bag and fill with sand. She also has her own room (It was my office) which makes her feel safe when using the box. I put puppy pee pads under the boxes. It catches a good amount of litter and it serves double duty since one of my kitties tends to turn the wrong was when pooing and will get it half in and half out of the box. YOGA MATS work well for litter mats! Get a robot vacuum! That’s how I deal with the CONSTANT kitty litter trail across the house! Thank you so much for the help! It is a real challenge to maintain the cat litter and not have it all over your house. Dealing with a senior cat with many mobility issues, I first cut all the entrances to litter boxes to one inch from the floor, then I would put a tote top under the box to catch no so much litter but accidents, I also used cat pee pads which were a life saver. I recently got a restaurant “bun pan” that is huge with a very small lip on it. The litter box sits in that and the scatter isn’t too bad. The cats have trained me over the years to not walk around bare footed LOL We cat people are very inventive, if there’s a will we will find a way. I recently bought a SmartCat litter mat which is soft and large, it is a bit lightweight so if you have a scratcher it might end up in the litter box. I have 5 cats, or rather, they have me! They have 3 litter boxes – under the boxes, first is a plastic shower curtain, then washable rugs all leading towards the door of the room. I end up with litter everywhere. I think they throw it at each other or toss out pawfuls of litter. much thanks for all of the help. I dont really mind litter tracking. What I DO mind is kitty litter DUST!!! I have tried almost every litter out there and ALL of them leave dust. This dust is very hard to remove, and I clean houses as a way of making money. Almost all my customers have cats, because they KNOW how much I love these wonderful creatures! Every house I clean has litter dust and tracked litter. The tracked stuff is easy to get up – the dust is not. Any suggestions on that would be appreciated! also, if you own any type of computer, hit it with the vacuum hose at least once a year. i do it on April Fool’s day, so it’s easy to remember. you’ll be surprised at how caked up the processor cooling fins get, the interesting places dust can collect inside computers. After trying tons of cat litter with dust I finally found one that has NO dust!! Try OnlY Natural Pet grape seed cat litter! It is amazing!!!!!! Highly recommend! I use CatSpot coconut litter. No dust. No odor. Scoop out the poop then stir the litter, which absorbs the pee with no odor. Change every two weeks. It does track. I am surprised they don’t sell big litter trays for cats! What I did was buy a great big replacement tray for dog cages, the largest. I have 2 arthritic cats, so high sides wouldn’t work. I cut a lower entryway (& sanded!) in a normal litter pan, then put the whole thing – giant dog tray & litter pan on a rag rug. So there’s a lot of room for my kitties to throw litter in the air even, while digging, and all of the mess stays behind on the big dog tray & rug! So far, it’s been the best solution for my multi-cat (3) Family. Have you tried having a groomer ( I have one in- house) clean hair out between the cats toes with a clipper? Works well for my long haired cats. I have 9 indoor/outdoor cats. I have a large litter box with high sides. Cats like to eat and then do their bussiness, cats don’t really like using a litter box, so on mild days I just leave the door open and they go out to do it. I clean it 2xdaily, sprinkle baking soda (for odor), and cat flea powder on it. Hope this helps. Sue, I had the same honor. My baby made in the bathtub. Never used the box. Maybe get her to go in the tub, then out a litter box in the tub for her. If at all possible if she pees in the tub, throw a bit of litter on it, scoop it up and sprinkle in the box. She’s marked her spots outside. So if you follow her you at be able to scoop a little dirt for the litter box. I have the honor of having a feral cat that comes in and out of my home. She does not use the litter box and I have tried a few types of litter. During a hurricane or rainstorm she whimpers. She has never made in the house. If I could litter box train her my life would be easier. Any suggestions? Much thanks. They do make a cat litter attractant Maybe that would work. I took a tip from an online vet who has multiple cats (as do I) instead of buying expensive litter boxes I just buy cheap plastic totes like the kind you use to pack away stuff. I use the lids as trays and it really does help. Plus I have bought special cat litter mats but I have to say none of them are perfect and I still have cat litter in the house. But it has been greatly improved with the cat litter mats I got on Amazon. KatKave makes a fantastic heavy duty huge covered litter box. Not cheap but worth every penny !!! I use “Slide” litter with a mat at the box opening and have very little litter tracking. Bonus- Slide is dust free. Yes ,I love Slide litter it works so well for me too! I use litter trays with hoods they are great and control the smell, I also use litter trays that have a detachable lip around the edge that are sold at pets at home, they are a bit more expensive than a basic litter tray but well worth paying for as I do not get any litter mess. My solution was to get the tray you put under a hot water heater and put the litter box in that. Works like a charm.